RUTLAND — It was a busy and successful week for both the men’s and women’s basketball teams at College of St. Joseph. They went 7-1 cumulatively with a number of impressive performances. The Lady Saints went 4-0 on the week and extended their winning streak to 15 games, giving them an overall record of 17-1. They are currently ranked No. 1 in the USCAA Division II Women’s Basketball Poll. The men’s team went 3-1 on the week and are now 14-7 overall. They are at the top of the YSCC as they have a solid 9-1 conference record. Here is how the past week unfolded. The men’s team followed suit and also earned a victory against NHTI with a much closer score of 78-64. Kareem Brown scored 25 points and snatched a staggering 18 rebounds, leading his team to victory with his dominating performance. He came out of the gate being more aggressive than usual and proved how much of a force he can be. Regina Steele dominated the Falcons’ defense with 21 points and 20 rebounds to secure an 89-63 victory over Fisher College. CSJ also received solid efforts from Mookie Kennedy and Jazz Laracuente. Kennedy finished the game with 19 points on 8-of-20 shooting while Laracuente also added 19 points going 7-of-16 from the floor. The Fighting Saints suffered a tough 76-97 loss to the Fisher Falcons. CSJ played well for stretches of the game offensively, but were unable to stop Fisher’s strong offensive attack on the other end of the floor. The Falcons shot 50% from the field and had five players score in double digits. Mookie Kennedy and Arreonte Anderson led the Lady Saints to victory against Maine Machias in a game that ended 102-37. Kennedy scored a game high 31 points and Anderson was right behind her with 28 points to go along with 11 rebounds. The men’s team won in a thrilling overtime battle against Maine Machias that ended 81-73. 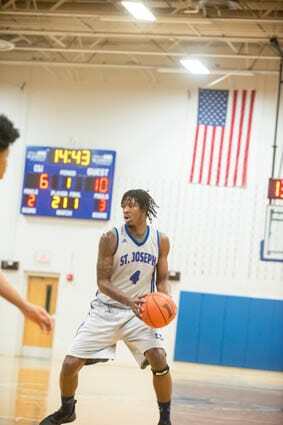 Kareem Brown showed up for the Saints once again with a game-high 28 points and eight rebounds. The Lady Saints inflicted their largest point differential win of the season to Unity with a final score of 107-14. Mookie Kennedy, Jazz Laracuente, and Arreonte Anderson all scored over 20 points throughout the game. CSJ also stole the ball a record 40 times. The Fighting Saints ended the week on a strong note, beating Unity comfortably 99-71. It was another game led by CSJ center Kareem Brown. He had a game-high 21 points on 10 of 15 shooting. Travis Threewitts also played big with 19 points on 8 for 11 shooting.